Are we ignoring our future? Capacity and the discussions taking place around mental capacity are becoming increasingly regular. As a population we have been ageing for a number of years, it is now starting to become apparent that as dementia has increased, added to other health issues, our future capacity and our ability to make decisions regarding our health and welfare has become a much more contentious issue. The worry now is that the UK may be facing an incapacity crisis. As studies of dementia have revealed more, it has shown that it can affect the mental capacity in people of all ages, not just the older generation and this is often overlooked. It is not just those of us over 60 who need to consider how decision will be made for us if we no longer have the ability. It is estimated that by 2025 (in just 6 years) there will be 1.3m* people living with dementia (including undiagnosed) in the UK. As the level of dementia is predicted to rise and the number of ageing people is increasing, then the level of incapacity is set to grow whereby the impact on families, the economy and the healthcare system may be dramatic. 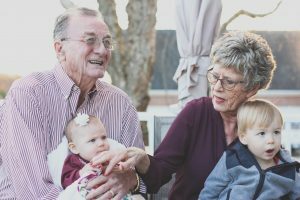 Care costs are predicted to increase to support the rise in support required, and the impact on handling family affairs will be huge, as the number of Health and Welfare Lasting Powers of Attorneys (LPA) being made is not matching the growth in incapacity. If we do not have an LPA in place stating who we would like to designate to make decisions on our behalf, then the courts will do it instead, and the final decisions may not be best for ourselves or our families. There will also be impacts to local businesses who do not have business LPAs in place, affecting staff and business partners and their families, and so decision will be left to families and friends, with costs being incurred, the courts possibly being involved and wishes not being adhered to. More than 60%* of people believe family members will be able to make medical and care decisions on their behalf should the need arise, and that family have the legal power to do so. But unless there is a Health & Welfare LPA in place then this is just not the case. There is huge public misconception as to how decisions will be made, and by whom, if they are unable to do so themselves. In cases with no LPA then the Court of Protection will become involved, which can be costly, upsetting and give long delays, with outcomes not being what the client, or their family, wishes. Yet 79%* of people in the UK have not even discussed what their wishes would be for care and medical choices (such or organ transplants) if they were unable to make the decision. So it is thought that we, as a nation are simply not planning ahead. We are aware that dementia is an increasing issue, that more care is needed and yet we are not considering that this (and other diseases such as stroke) will affect us personally. Yet here at MMAW we are seeing more people come to us about LPAs, but when the individual’s capacity has been lost and it is just too late to put an LPA in place. The distress and impact on a family can be huge. The most vital aspect for a Heath and Welfare LPA is to ensure it is done early enough, before any possible signs of incapacity – if there are signs of incapacity the LPA can be disputed. Ensuring capacity can help you in a number of areas for any financial decisions that may be made. This type of Lasting Power of Attorney can only be used when you are unable to make your own decisions. This type of Lasting Power of Attorney can be used as soon as it is registered with the your permission, so for example if you are going to be out of the country for a long time. If you would like to get a LPA in place then just call us on 01522 500823 or email us on enquiries@makemeawill.com.